Wordpress has a bad reputation on the web for being bulky and slow, but that doesn’t have to be the case. As most bloggers build up more content, add bigger images, install new plugins, and move to feature-rich themes they forget that speed is a huge factor in their site’s performance on the web, especially with more consumers using mobile devices. PHP 7 offers a lot of new features over PHP 5.X, but more interestingly, it offers a huge performance increase. While it looks like HHVM, Facebook’s PHP compiler, may be a bit faster, the results were pretty nominal, and the switching cost is a bit higher for HHVM than for PHP 7, so I opted to just upgrade to PHP 7.0.0. Heroku is now running PHP 7 by default, so that’s good news if you’re already hosted there. Updates to the Wordpress platform happen pretty frequently, but it’s important not to get too far behind. Core updates improve speed, security, and functionality, so they’re a no-brainer if you’re trying to get the most speed out of your Wordpress install possible. I’ve found that a lot of Wordpress plugins, even very popular ones, are very poorly written and not at all performant. If you have the resources, hire a developer to spend a couple hours taking a look at your plugins to make sure there aren’t any red flags. If there are plugins that you know you don’t use, you should definitely uninstall them as they may be slowing down your site behind the scenes. After completing steps 1-5 above, I had my page load time down to a consistent 1.5 to 2 seconds, but I wanted to see if I could go further. In my site’s case, most of the content is static (meaning users can’t interact with or add to it), and I only post an update every week or so. I’d had a little exposure to Varnish from when Packback was on Shark Tank, so I decided to dig in deeper and set it up for my own site. Varnish is a complete page caching mechanism that basically saves a static version of any page on your website and serves that up to visitors unless you tell it to do otherwise. For static pages like blog posts and pages, Varnish is perfect, and thanks to services like Section.io, you don’t even have to install it on your own server. 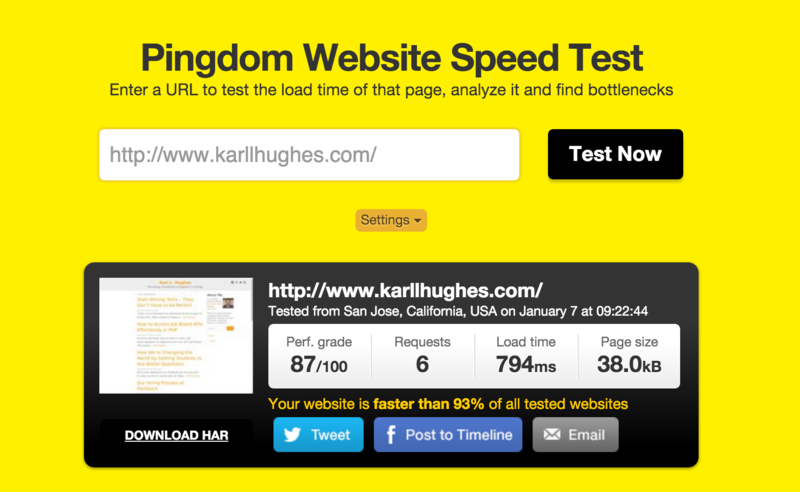 So that’s everything I did to get my Wordpress site to a sub 1-second load time. My blog’s whole code base is open source, so if you’re interested feel free to fork it for your own Wordpress site. There’s plenty more that you could do to speed up a Wordpress site, depending on where you host it, how you set up your database, and how comfortable you are digging into code. If you’ve got your own tips or you’d like to hear more, shoot me a message on Twitter.